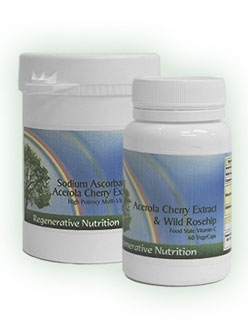 Acerola Cherry Extract: one of natures highest concentrations of Vitamin C. The extract is the water soluble components of the cherry and contains 17% vitamin C along with all the essential bio-flavenoids and other important co-factors. 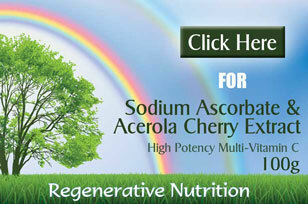 Sodium Ascorbate: gentle form of pure soluble vitamin C.
Acerola extract is valued for its gentleness of action and superior effectiveness, compared with isolated Vitamin C. One of the few products on the market that is retained by our body. The fruit of the Acerola is one of the richest-known natural sources of vitamin C. It contains an array of bioflavonoids, vitamins, minerals & other phyto-nutrients; an ideal food-based source of nutrition. The free radical scavenging benefits are useful for lessening the tendency to degenerative disease and fighting cellular aging.Conversely, large doses of isolated Vitamin C can lead to imbalances such as anxiety, poor sleep & mineral depletion. We have found, however, that moderate daily doses of Sodium Ascorbate are well tolerated, even by sensitive persons. Click the banners below for more info on our two Vitamin C products.